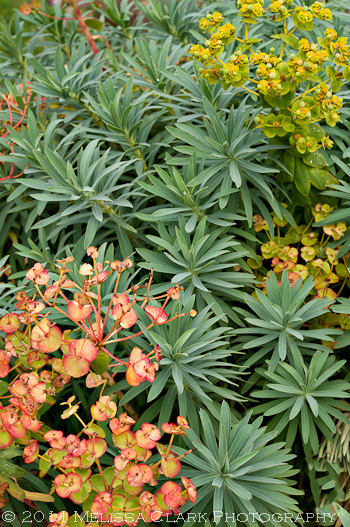 Aren't these euphorbias in the OBG splendid? 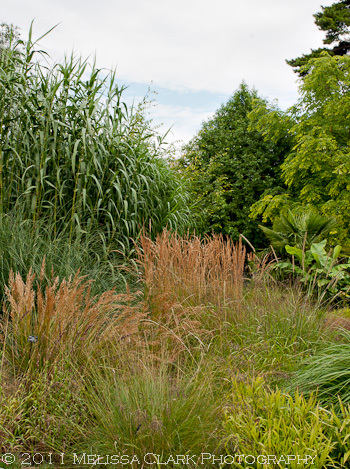 A view of part of the ornamental grasses bed at the Oxford Botanic Garden with Karl Foerster and Miscanthus grasses, among others. 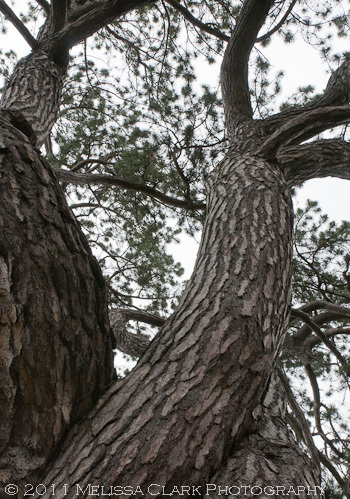 and the “Tolkien tree.” This Austrian pine (Pinus nigra sp. 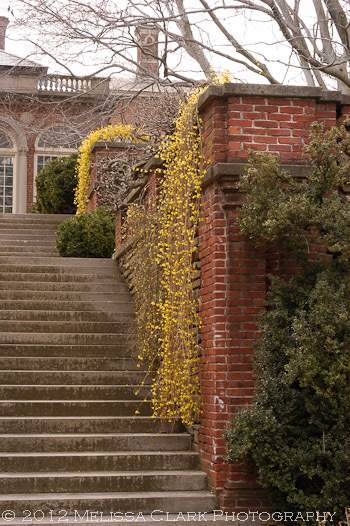 nigra), which must be at least 60′ high and has grown from a seed planted in 1790, was described by one of the OBG gardening staff to us as the one that inspired J.R.R. Tolkein (a fellow at both Merton and Exeter Colleges during his many years at Oxford University), to create the Ents, massive anthropomorphic tree characters in The Lord of the Rings. The "Tolkien Tree" inside the walled garden at the Oxford Botanic Garden. All these wonders (and many more, including poppies in bloom in August, lucky Brits!) 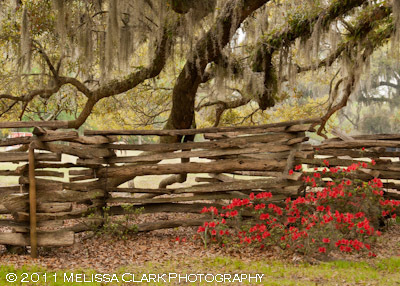 can be seen inside the walled portion of the OBG. Pass through the door in the wall beyond the Tolkien tree, however, and you encounter another feast for the eyes – the Autumn Borders, designed by the husband and wife design team of Nori and Sandra Pope. I’ll let the photos tell the richness of this scene. 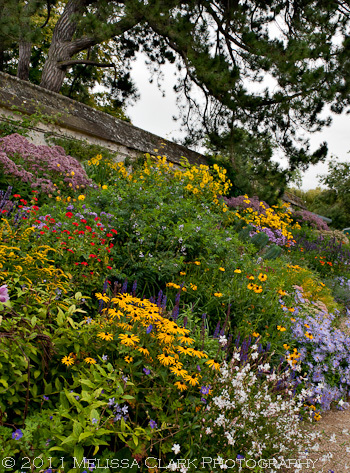 A section of the Autumn Border that sits underneath the Tolkien Tree on the other side of the wall. 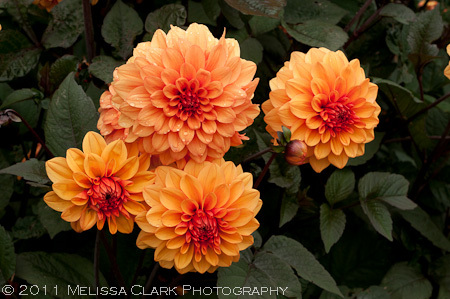 Another variety of orange dark-leaved dahlias in the Autumn Border. 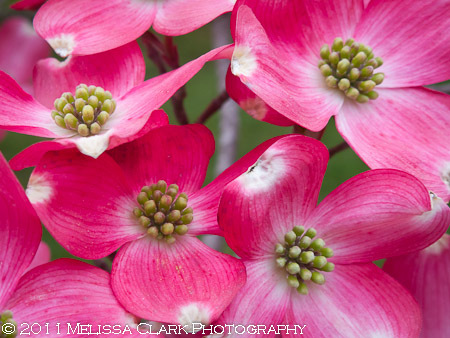 If you’re interested in learning more about the Popes and their work with color in the garden, I can recommend their book Color by Design: Planting the Contemporary Garden, with photography by Clive Nichols, whose work I greatly admire. 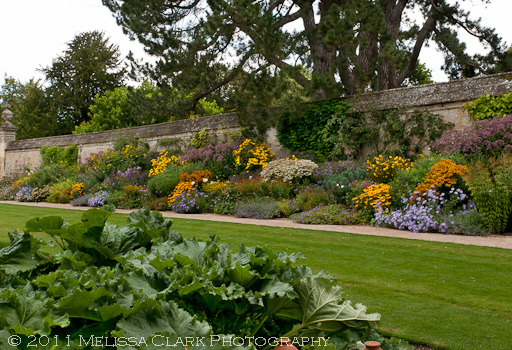 And if you are ever fortunate enough to visit Oxford, be sure to leave time to visit the Oxford Botanic Garden. 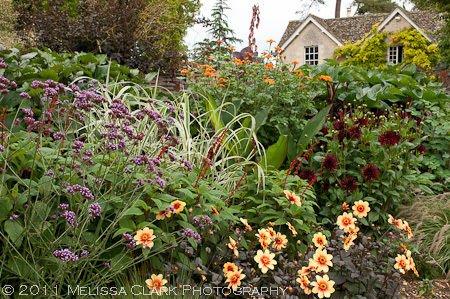 Recently a client asked me to photograph his wife’s garden for the purpose of surprising her with a few prints of it. Since this is the direction in which I would like to head my efforts as I contemplate retiring from landscape design work, I was only too happy to oblige. 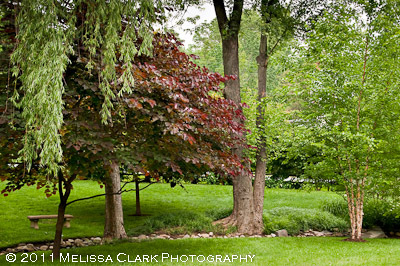 The garden (designed by his wife) is lovely, a shady paradise less than a block away from me. But after I processed about a dozen images for possible prints, he asked if I could convert some of them into black and white or sepia. I’d never done this before, and was skeptical. But what I found as I experimented with the images from their garden and others I’ve shot in the last couple of years opened my eyes to a new way of thinking about photographing gardens. 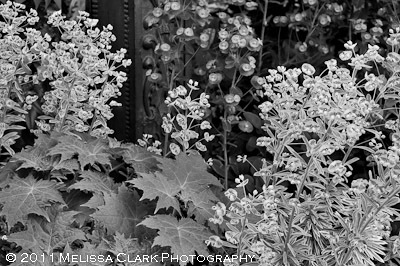 Here are two photos from a recent garden shoot (different garden), first the color and then the black and white version. 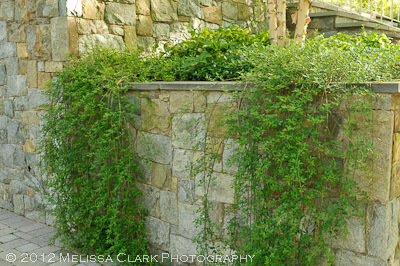 Epimediums and ferns in an early spring garden image. 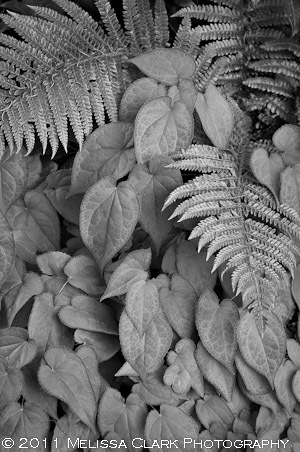 Rendered in black and white, the image is more about shapes and textures. Here’s another pair, from the same garden, with more contrast in the tonal range this time. Euphorbia and an unidentified broadleaved perennial (cimicifuga?) 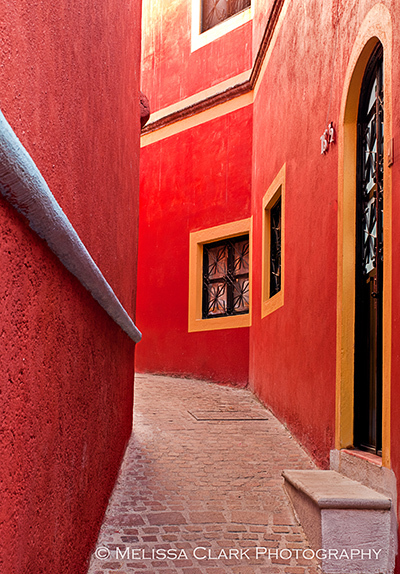 offer contrast in color, shape and texture. Greater dark and light variation in this image makes it more dramatic as a black and white photo than the previous example, I think. But somehow I like the ferns and epimedium shot more. The last set from this garden is probably my favorite. 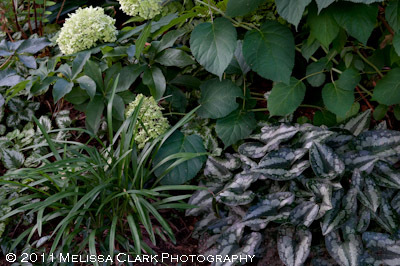 The client had asked for some photos of the variegated ginger, a slow-growing but spectacular groundcover for shade. The same image converted to black and white. A partially-opened lotus flower shot at Kenilworth Gardens in Washington DC last summer. Ever so much more appealing, I think, in the black and white version – which surprised me. The same image in black and white. 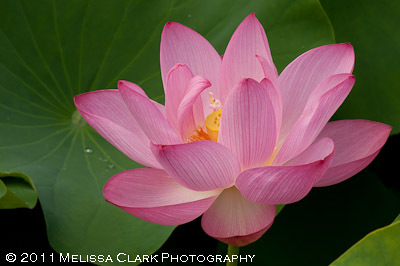 In the second image, the veins on the lotus petals stand out more and the whole flower seems to float against a darker background – and the water drops on the leaf behind the flower really shine. I’ll close with a hybrid – an image originally taken in color (as all of these were), converted to black and white in Silver Efex Pro, and then the underlying color layer ‘revealed’ through the use of a layer mask. A black and white version of the same image. 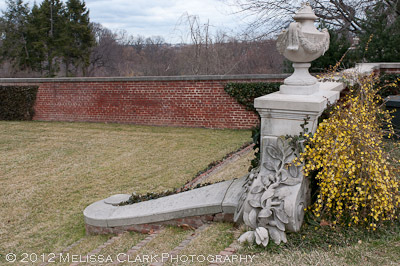 Without the azalea in color, this would look dull. Trust me. I vacillate between liking this final image and thinking it looks too gimmicky. But I thought I would include it because it shows something a little different from straight color and straight black and white. Silver Efex Pro (now available in an upgraded version, which I don’t own) is a versatile program that can be used as a stand-alone or integrated into Lightroom and Photoshop. It offers more variants than you can imagine in terms of different “looks” for black and white images, including sepia, infrared, and a variety of custom effects you can create yourself. For what I do, I don’t envision using it more than occasionally, but I found it easy to use and more flexible than the black and white options available in Lightroom. It has been a cold and rainy spring here in the Washington area so far. The Tidal Basin Yoshino cherries bloomed late, forcing the mobs who wanted to stroll under their gorgeous branches to bundle up as if it were still late February. Now it’s mid-April, and the weather is warming up a bit. My crabapple is getting ready to burst into bloom (the parts that don’t have fireblight, that is . . . sigh). 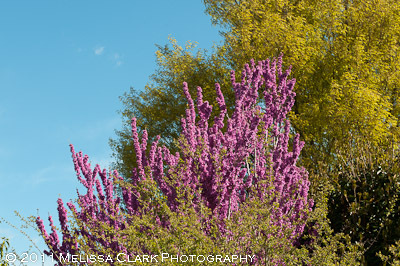 In the meantime I’ve been admiring another one of my favorite spring trees, the Eastern redbud (or Cercis canadensis). 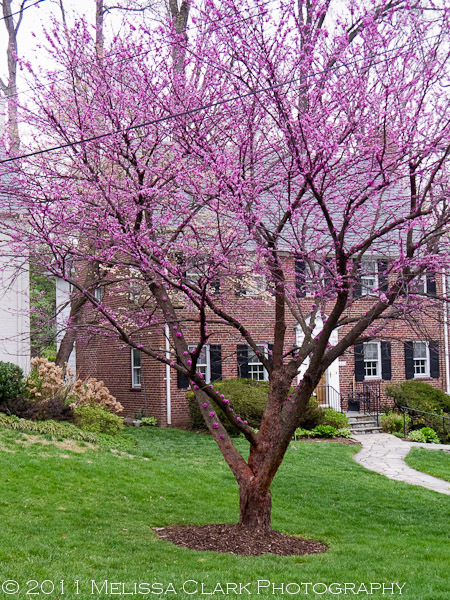 A redbud tree as a specimen in a suburban DC front yard. 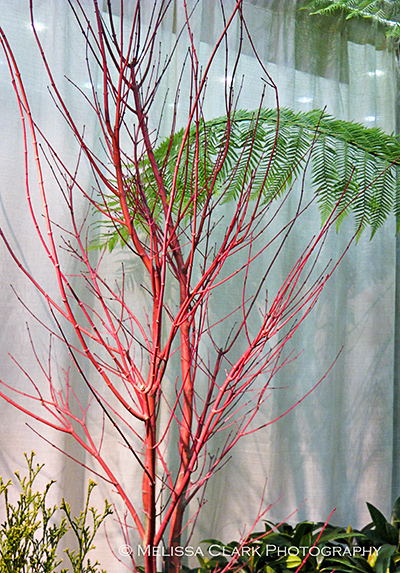 This tree’s buds form directly on the branches, before the leaves come out, and are usually a very intense purple-pink shade. Cercis canadensis buds on a tree limb in early spring. Before you know it, the limbs are literally covered in these buds, which expand into small blossoms. 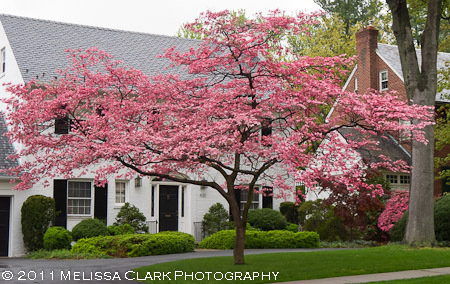 A favorite type of redbud for designers around here to include in residential gardens is called “Forest Pansy.” Its leaves are burgundy, as opposed to green, unless the weather gets too hot, in which case the unusual color can fade. The foliage on a Forest Pansy cultivar has a reddish tint. 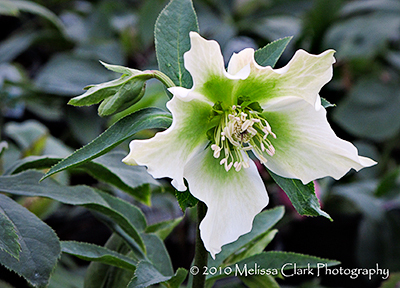 Note the heart-shaped leaves. 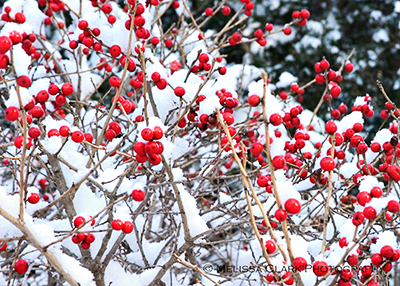 These trees have stout trunks and a spreading habit – give them room when siting them. 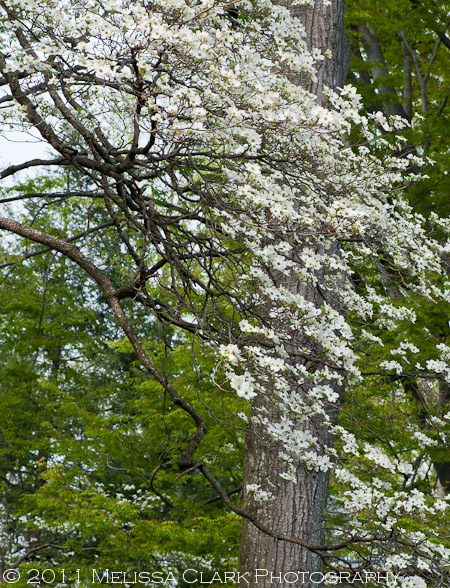 They rarely grow over 25′ tall, and have life spans of 35-40 years – nothing like an oak or maple. But in the right place in the landscape they can add a lot in spring. 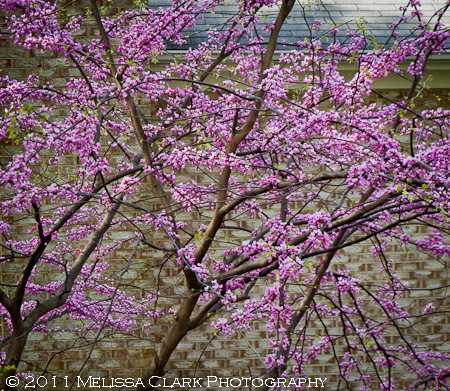 A Forest Pansy redbud brightens an early-spring landscape. 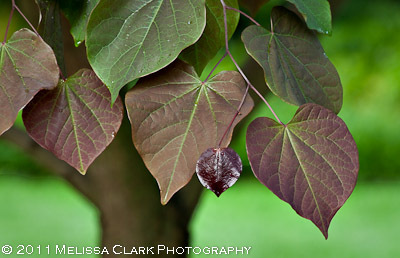 For those who crave something a little more exotic, you can look for a Chinese redbud, or Cercis chinensis. The National Arboretum developed a cultivar of this rarer version of the redbud some years ago, called ‘Don Egolf,’ but I haven’t been able to find it except occasionally from mail-order firms. 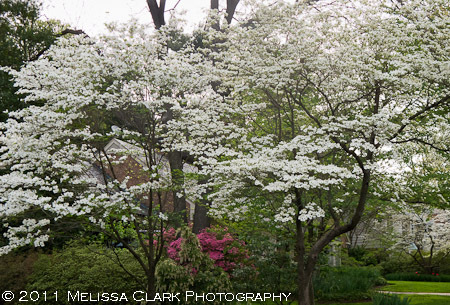 When I was down at the Lewis Ginter Botanical Garden the first weekend in April, however, I spotted several C. chinensis ‘Avondale’ trees. 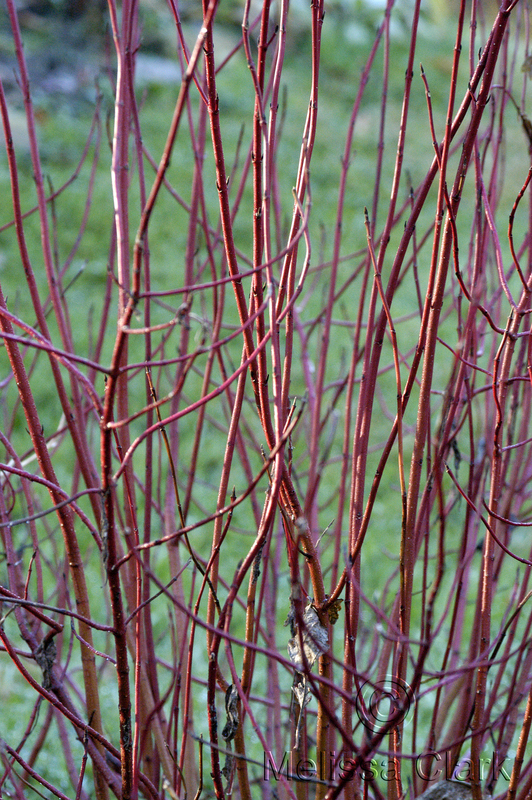 Their habit is very different from that of a regular redbud – much more upright in shape, making them ideal for including in tighter spaces. 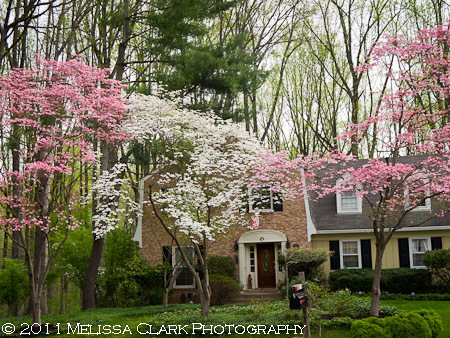 When I saw one on its own around the corner from this one, however, I didn’t care for the way it looked as a specimen standing alone – it seemed like a bunch of large redbud branches stuck into a vase, like a crape myrtle trying to sprout pink buds along its branches from the ground up. 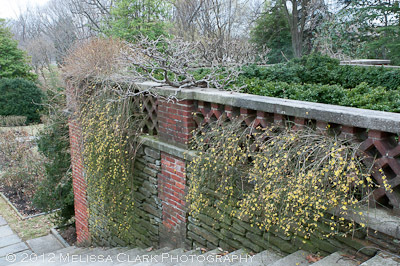 Still, I wouldn’t mind finding a way to include one in a mixed border of trees, like here. 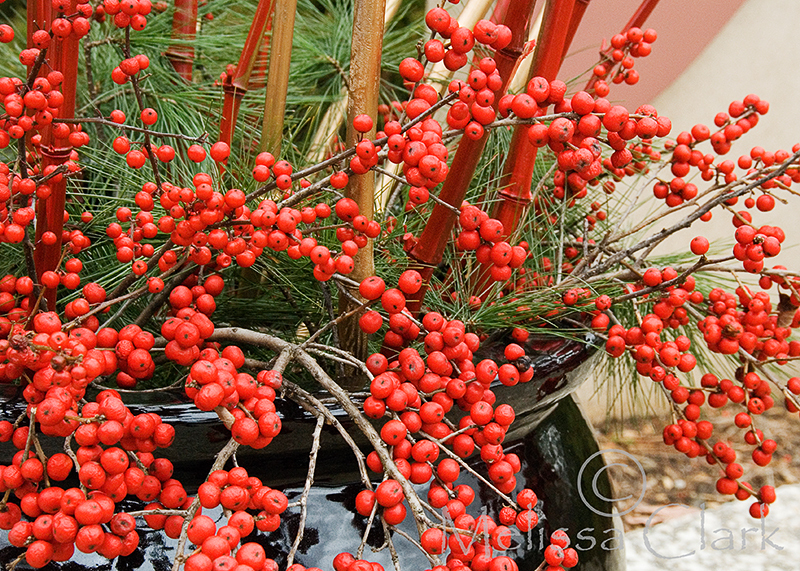 Especially in the garden, variety can add spice to life.